My first monthly article “Language Play: 5 Speech and Language Games for Travel” was published today on the Hilltown Families website!! Check it out! Does anyone have a topic they would like me to write about in the future? 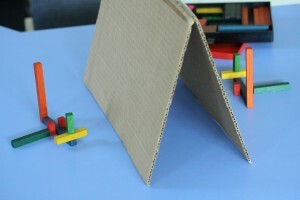 One of my most important functional communication probes is just a piece of cardboard and some colored blocks. Two people face each other with the cardboard blocking their view. One gives instructions to the other about how to set up the blocks. They can only use words, no gestures. They’re allowed to ask questions. The goal is for the structures to look the same (in mirrored form since their rights and lefts are opposite). Usually, lots of skill levels are revealed. For the instructor, can they take the other’s perspective? Can they explain clearly with lots of description? Do they anticipate the mistakes the listener might make, and adjust what they say to avoid the mistake? For the listener, do they know when they’re confused? What can they do if they’re confused? Can they do exactly as instructed? Are they ready to listen to the instruction? Do they know how to explain what their difficulty is? So typically the first few times, they make mistakes. I point out the breakdowns and ask what they could do differently next time. Then they switch roles. In each session, I watch how they get better at giving and listening to directions. Sometimes, I mix it up so the student has a different listener. The instructor’s communication may need to change for a new person if their learning style is different. This teaches the flexibility that’s built into the fast, dynamic social situations in our everyday lives with many communication partners. I believe the communication breakdowns in this exercise are a metaphor for the miscommunication leading to fights, misunderstandings, even wars! And the more my students are aware and adapt to different people’s styles and abilities, the better equipped they’ll be to handle what happens at school, home, and at a job. I had two students do this exercise recently. The instructor didn’t communicate well and the listener just did whatever he wanted. It took about 4 sessions before they were on the same page. By that time, they understood what was hard for the other student and what to do about it (ask more questions, repeat it several ways, etc.). One of my students did a barrier game with his parent. It turned out, the parent wasn’t always ready for the initial instructions the student gave and kept asking questions that required the student to start all over (“which block?”). The student became very frustrated. We discussed what happened and figured out what they could do differently (parent should attend to the first part of the instruction; student should take a deep breath and calm down). In the next session, they had really worked it out. Each one really made an effort to use the strategies we discussed. Their block structures were a perfect match due to their efforts!! I was so proud of them. I’m hoping that they can now carry the strategies over into their daily communication. I’ll be sure to ask at the next session! Do you know anyone who would benefit from a barrier game? CONTACT ME. I have always loved silent movies. I find the actors’ gestures to be more powerful than stiff acting with tons of dialogue. Blah, blah, blah! When I was in graduate school, working with stroke victims, I was told that silent movies could be used for rehab therapy to help brain injured people to analyze nonverbal body language and facial expression. I now use them in my sessions with young students to encourage social thinking skills, nonverbal reasoning and inferencing (making educated guesses), facial emotion identification, and prediction. I guide them to notice the “facts” they are seeing by stopping the action and discussing what they see and then moving to the motives behind the body language. I mostly use the fun slapstick classics, W. C. Fields, Charley Chaplin, and Buster Keaton. For some big belly laughs I use Fatty Arbuckle. There is nothing as wonderful as the sound of that joyous laughter! For many, it is a moment of freedom from the straight jacket of their rule-bound rigid thinking. Do you know someone who needs a good belly laugh while they work on what is hard for them? Let’s talk! CONTACT ME. Whenever I do a speech and language evaluation, I use measurement tools to tease out individual communication strengths and challenges. But, I was also trained to put these skills together to get an idea of the functional communication of the person in the real world. I am eternally grateful for this training, because to look at one or the other (individual competence vs. the whole picture) would only tell half the story. And I am constantly surprised that some of my clients are great at individual skills, but cannot put them together functionally; while other folks struggle with individual areas of communication but look competent during functional communication. Why would any of this be important? Because it impacts our confidence and success in life to know our strengths and challenges so we can enhance a strength, or learn and use strategies to compensate for a challenge. To boost young children’s confidence, support teams can set up good learning environments and provide opportunities for practice. When we know that there is a way to solve our difficulties, it eliminates a sense of failure. And what a different world it would be if no one felt like a failure! Does your child/student know that there’s a way to solve their difficulties? Let’s talk. CONTACT ME.